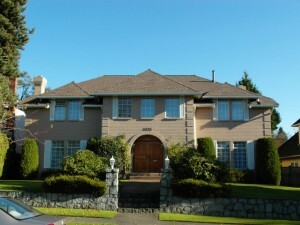 Protecting your British Columbia home from the elements is the primary job of your roof. Your roof is actually a complex system of interlocking components that must all work together to create a powerful barrier against rain, snow, ice and wind. At Crown Roofing we treat your roof as a complete system, from the bare decking up to the ridge ventilation — even the gutter system. That is the only way to ensure that your home is protected. Your roof is more than just a cover on your home. A properly designed and installed roofing system consists of several components, all of which work together to provide the best protection against the weather. As the most trusted name among Vancouver roofing companies, Crown Roofing has deep experience in installing each of these important components. Roof Deck – This is the system of flat panels that are attached to the rafters of your home and form the base layer of the roof itself. Usually made of construction-grade plywood. Underlayment – Specially made felt paper or rubber membrane is installed on all exposed roof decking. There have been technological advances that have upgraded this component resulting in greater strength and breathability, which prolongs the service life of wood decking. Ice and water shield – This component is critical for watertight integrity in critical roofing areas, usually along the roof’s edge. The leak barrier is installed a minimum of 6 feet up your roofline from the edge of the roof at gutter/eaves (which is code), down valleys (where two roofing planes intersect), around the chimney, at the intersection of a roof plane and a vertical wall, and around any penetration through the roofline (soil stacks, vents, fans, skylights, etc). Starter strips – Another critical component, the starter strip is specifically manufactured for installation at all edges of your roofline to prevent wind and water intrusion under shingles. Shingles – These can be asphalt (most popular), fiberglass, tile, wood or slate. All shingles should have a written manufacturers warranty against defects. Flashing – Flashing is metal or copper seals that are placed around vent pipes, chimney or other protrusions to prevent water from leaking through a gap between the object and the roof. Also used in high volume flow areas like valleys and joints. Ventilation – Proper ventilation provides longevity to your wood decking and every other roofing component. Even more critical than this, proper ventilation helps to prevent the formation of “ice dams” that can cause melting snow and ice to back up into the home, causing expensive damage. Shingle cap – An overlooked area, this special shingle is manufactured specifically for different grade of shingles. It covers the peaks of your roof, enhances the roof’s look and validates the system’s warranty. Warranty – It is only as good as the company behind it! Crown Roofing not only carries manufacturer warranties on the products we install, we also offer a full 10-year warranty on our workmanship. Crown Roofing LTD installs roofing systems by manufacturers with great reputations and solid warranties. We are certified by major suppliers including GAF and Owens Corning. These products meet our stringent standards. More importantly, we trust these products to provide years of dependable service on your BC roof. Our BC roofing installation crews are trained and certified to each of the manufacturer’s standards. That’s vitally important in this industry: roofs installed by uncertified roofers can void the manufacturer’s warranty. For repair or replacement of your home’s roofing system call the roofing contractor Vancouver and roofing contractor Richmond you can trust: Crown Roofing LTD at 604-370-6288.